In 2012, the Environmental Protection Agency (EPA) and National Highway Traffic Safety Administration (NHTSA) set joint fuel economy and global warming emissions standards for passenger vehicles out to 2025. These standards (taken together with those finalized in 2010), which cover new vehicles sold from 2012 through 2025, represent the biggest step the country has taken to reduce oil use and global warming emissions, and it’s already paying dividends. Due to a limitation of NHTSA’s authority that says the agency can finalize standards for no more than five years at a time, this policy is currently undergoing a “mid-term review.” This review process will examine the regulations in light of many factors that may have changed over the past four years, including unforeseen technology advancements, changes in consumer acceptance, and lower fuel prices. The process is currently underway but will be formally kicking off with a draft technical assessment report to be released shortly, upon which the agencies will ask for public comment. To help everyone make sense of these rules, UCS is beginning a fact sheet series on the mid-term review to discuss various issues of concern. The first three fact sheets are being released today, and we will continue to release new fact sheets over the coming months to help illustrate why these standards are important, what they mean for consumers, and why automaker efforts are better spent on continued innovation instead of lobbying for less stringent regulation. Nothing that has happened in the past four years suggests that these standards should be weakened—in fact, given the technology development spurred to-date, this is an opportunity to strengthen the standards for 2025. 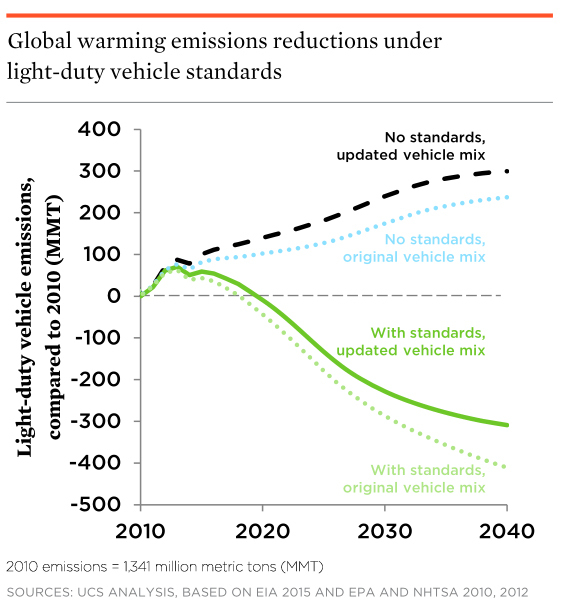 Without strong fuel-economy standards in place, global-warming emissions from passenger vehicles would skyrocket to levels even higher than anticipated in 2012. Flexible standards help reduce emissions; however, consumers buying more trucks and SUVs means that a stronger rule will be necessary to achieve the agencies’ original projected level of improvement. Whether it’s because of low gas prices or more efficient SUV choices, it’s clear that consumers have been buying more SUVs than ever before. But despite automaker pleas, that isn’t a reason to weaken the standards. These standards were designed to give consumers efficient vehicle choices across all sizes and types of vehicles, and that’s exactly what they’ve done. Automakers are selling more efficient cars, trucks, and SUVs alike, which is why they find themselves well ahead of the regulatory targets. Without these standards, increasing sales of SUVs would have moved fuel economy backwards, just as it did more than a decade ago. However, we will need even stronger standards in order to move forward on our climate and oil use targets in 2030 and beyond. By setting targets for 2025, regulators gave suppliers and automakers a clear long-term goal, helping to spur significant investment in technology development and deployment—and that investment is paying off. Automakers have come up with low-cost ways to get more out of vehicles powered by internal combustion engines that the regulators never saw coming. High-compression engines prove that you don’t need a turbocharger to get more out of a smaller engine—with up to a 15 percent improvement over the conventional engine, Mazda’s SKYACTIV engine is an example of how successful this technology can be and a major reason for Mazda’s position as the most efficient vehicle manufacturer. With nine– and ten-speed transmissions coming on the market and the wide deployment of efficient continuously variable transmissions, automakers are continuing to find new ways to make sure the internal combustion engine is running at its most efficient point, regardless of vehicle speed. Cylinder deactivation has been around for years on larger engines, but novel control strategies from suppliers and automakers alike will see improvements of up to 10 percent applicable in even small engines. Lighter vehicles require less energy, and investments in materials and manufacturing will continue to see wider deployment of lightweighting across the fleet, whether that’s advanced carbon fiber, high-strength steel, new aluminum alloys, magnesium alloys, or even lightweight polymers. Vehicles like the Chevy Malibu and Ford F-150 are shedding hundreds of pounds to save fuel, a trend is continuing across all manufacturers. One of the most obvious ways that a hybrid saves fuel is by shutting off the engine while parked at a stoplight. New 48V stop-start systems developed for conventional vehicles can also save fuel in this way, while also enabling additional functionality and flexibility, such as power for more responsive electric turbochargers or additional e-boost capability. These technologies are just a small sampling of the technology innovation occurring across the automotive industry, innovation which was unanticipated and helps build the case for why automakers can go do even more than originally expected in 2025. The fact sheet series is available at www.ucsusa.org/midtermreview. Stay tuned for future installments. CAFE regulations are not a particularly effective way to increase fuel efficiency or generate demand for fuel efficient vehicles. CAFE is judged against other economic programs for efficiency, not against the absence of any regulation. These standards need a re-think. They are fundamentally altering the automobile industry, and some vehicles will not survive the cull, though they are not inefficient, only inefficient relative to the arbitrary footprint regulations. There is no fundamental alteration in the auto industry nor elimination of vehicles as a result of these standards – these rules are designed to be flexible, which is why vehicles ranging from the F-150 to the Mazda 3 and everything between can exceed the standards as written. As to the design of emissions standards, there is what we have now (which works well), and what we had before them (which did not). Ideas that cannot be put into practice are largely irrelevant–do not make the perfect into the enemy of the good. More accurate to say that concerned scientists are not willing to acknowledge fundamental changes to the automobile industry. The first CAFE regulations created minivans and eventually led to the SUV boom, while simultaneously rendering fullsize sedans obsolete, despite their superior fuel economy relative to SUVs. CAFE 2025 doesn’t treat fullsize sedans much differently. The current regulations also examine two vehicles with nearly identical fuel economy, like Jeep Wrangler and Ford F150, and arbitrarily decide that the Jeep Wrangler must achieve 35mpg (EPA) combined by 2025, merely because the vehicle is small. The footprint provision was requested by the NHTSA who prefer larger footprints for safety. Fuel economy was not the consideration. Mazda are the darlings of CAFE 2016, but they do not have the cash reserves or borrowing power to finance the jump to hybrids. Even some major manufacturers like FCA lack the ability to rollout fleetwide hybrids. CAFE will force further consolidation, whether consolidation is economically warranted or not. CAFE 2025 is regulation with “good” intentions, but good policymakers would be wise to heavily modify the current fuel economy regime. It is not arbitrary that smaller vehicles should hit higher fuel economy targets – it is physics. Consumers have decided (for now) that large sedans are less practical than SUVs – when you compare something like the 300 to a CR-V, it’s hard to disagree. On the other hand, we are seeing a surge in interest in hatchbacks that try to marry space with efficiency in a more compact package. To that end, we have also seen an entire new market around smaller CUVs spring up. These rules are designed to be flexible such that whatever cars people are interested in are getting more efficient, period. What they don’t do is dictate what cars people should buy. You’re confusing physics with normative ethics. Physics doesn’t think a small car should be more efficient. Footprint is only a small piece of the efficiency equation anyway. Physics also understands that two vehicles with identical fuel economy produce roughly the same emissions, regardless of the wheelbase and track. However, NHTSA regulators believe roads will be less safe should CAFE encourage smaller cars; therefore, the footprint regulations create incentives to increase vehicle footprint. These regulations need to be reworked or repealed, and the time frame for implementation should be extended, especially since CAFE 2025 will accomplish little if consumers jump to big light-trucks ala CAFE 1979. Our analysis shows pretty clearly that a move by some towards larger vehicles will still result in a very large decrease in emissions. Physics is pretty clear on the relative difficulty in making a small vehicle more efficient than a large one. It starts with weight and cascades from there. It is obviously very possible to make two vehicles of different sizes to have equivalent fuel economies, but to do so requires additional technology…hence the low-tech Wrangler and high-tech F-150 example. There are always opportunities to refine the regulations–footprint creep (upsizing) is obviously a concern with a footprint-based standard, but that’s a case for any attribute-based standard. Still, we continue to look at issues like this and ways in which the regulations can be improved. Delaying them is obviously not one of those ways, particularly when manufacturers are having no difficulty meeting the standards and with a number of unforeseen innovative technologies already being deployed. We both know that CAFE 2016 is not comparable to CAFE 2025. The regulations become more stringent in 2017, and they get more stringent still in 2022. The testing fuel will also change during this time. Congressional midterm review is designed to protect industry and consumers from the rapaciousness of regulators who only know what they want. The augural standards are nothing like what we have now. If you believe CAFE 2016 has been a success, why are you eager to implement the upcoming changes? Don’t let good be the enemy of perfect. Extending the deadline is the only reasonable outcome by way of your own reasoning. Thanks for an informative summary of the progress that automakers are making on improving engine design, vehicle weight, etc. These are some specifics I did not know before. I will review the fact sheets to see what else I can learn. I hope UCS will encourage and provide its members with ways to contribute to and/or comment on the five year review taking place. Thanks. We will continue to provide our members with the best available data throughout this process, and there will be opportunity for the public to directly comment on the regulation following both the release of the draft technical assessment report (which should be available in the coming weeks) and a proposed rule next spring. Dave Cooke is a senior vehicles analyst in the Clean Vehicles Program, specializing in both light- and heavy-duty fuel economy.